Our Sauces Are Dripping With Attitude. Deep fried pretzel sticks with your choice of Nacho Cheese, Honey Mustard or our NEW Sabi Sauce. Want something a little green? chopped tomato & onion, sprinkled with black olives, breaded tenders chopped & tossed in Hot Sauce, topped off with your choice of ranch or our homemade blue cheese dressing. Don't knock 'em till you try 'em!!! sides of sour cream & Binegar's homemade salsa. Grilled or try it rolled & deep fried. A little bit of this & a little bit of that. Grilled chicken breast strips tossed over our fresh garden salad topped with shredded cheese. Our recipe is top secret! Half order - just the right amount for one. Pick 2 toppings that include any of our homemade sauces, shredded cheddar and melted cheddar...the possibilities are endless. Who knows? It might even end up on our menu! Step 1: How Hungry Are You? Available Tuesday - Friday 11:00 a.m. - 3:00 p.m. Dine-in and Carryout. No Substitutions. Every meal includes kids fries and a small drink. 10 & Under. 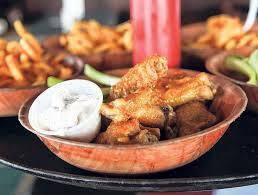 Thank you for choosing Wings on Brookwood. We are a family owned & operated business on the West side of Hamilton. Our chicken is always fresh & our boneless are hand cut. Salads are hand tossed & our sandwiches are out of this world. Our sauces, dressings & soups are made daily in house & we pride ourselves on serving our customers as friends & family. 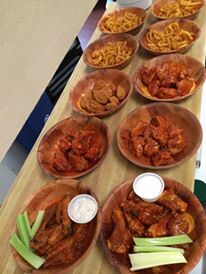 Hamilton’s hometown Wings…Simply the Best !!! Family owned & operated for over 20 years. Like us on Facebook for great giveaways & specials !! !